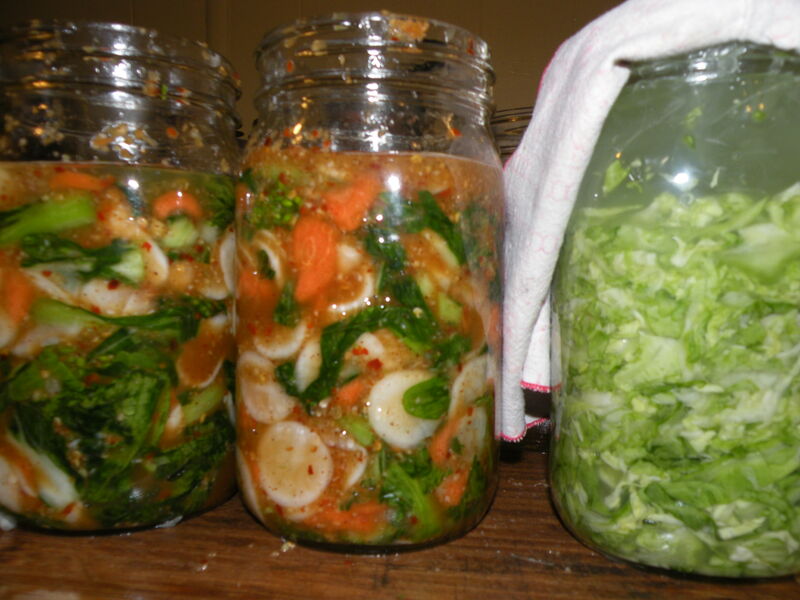 I have always wanted to give lacto-fermentation a try. My friend Kat has recently been doing it and was happy to come show us what she has learned. The process can take up to a week or longer depending on your taste for it. I started my jars on Wednesday night, so they’ve got a few days yet. They look so pretty, I’ve been peeking at them regularly…. Get everything chopped how you like it. I preferred some nice chunks and thin slices. Mix the vegetables well in a large bowl. The bowl needs to be big enough to cover with a plate inside, so as to hold the food down tight preventing air flow. Generously add sea salt to taste while thoroughly coating everything. It was roughly 4-5 Tablespoons for me, but I like lots of salt. You will start to notice the salt pulling the moisture out of the vegetables while you toss. Use your hands and then pat down and cover with the plate. Take a big yogurt container or something with a lid, fill it with water, cover it and put it on the plate for a weight to hold the plate down. If you can still see the vegetables around the edge of the plate, cover with a thin linen. 1 medium-large onion (about 1.5 cups) any kind. Combine in food processor until you have a nice paste. Rub paste gently into the veggies scooping out of the processor small handfuls at a time until everything is generously coated. Now for the process of stuffing the jars. Make sure the jars are clean. As you stuff, you want to push down well with a wooden spoon making sure that you fill all the air spaces. Fill and tamp down until you are a couple inches from the top. At this point brine juices may just about be covering every food piece, but may not. No worries, that’s why you saved it aside. I needed to add back some brine to fill just enough, covering every food piece with liquid. You want all the food covered in brine so it will be fermented. Pieces stuck to the side of the jar above the brine won’t be part of the process so don’t waste any and get it down in the juice. Now on a micro-level you want to recreate what you did with the weighted down plate in the bowl, except this time in the jar. Take a sandwich size zip-lock baggie and add enough brine to have the bag sit in the top of the jar filled to the brim. If you still have extra brine set aside use that in the baggie. If not make a salt water mix and use that. The idea here is that if for some reason the bag pops or leaks, you will just have salt-water-brine in there and can still save the batch, and your efforts. Cover with a linen and rubber-band the top. You are done! The same process for sauerkraut was used but the only thing in it is cabbage and the sea salt. Two of our spring green cabbages was about perfect for 1 quart jar. We sliced it very thin with a mandolin slicer. Warning!! They are sharp and you can lose your thumb or fingers so please be careful! 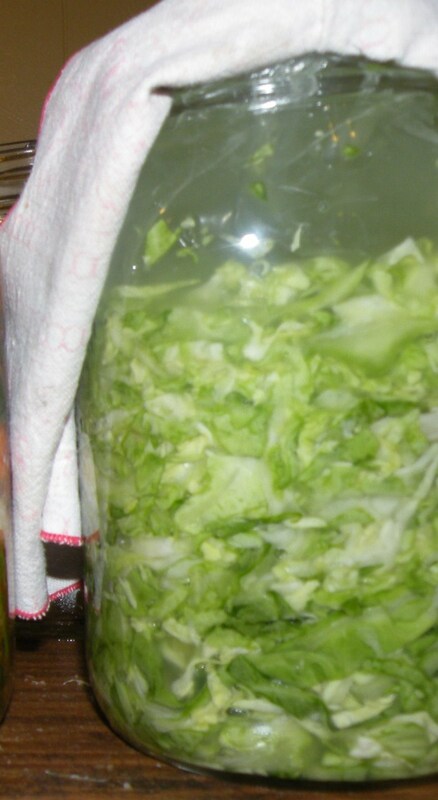 Then in the morning, I drained the brine away from the cabbage and set it aside. Then I stuffed the jar, tamping down tightly the cabbage. I filled the baggie with the brine and covered the same as above for the kimchi.